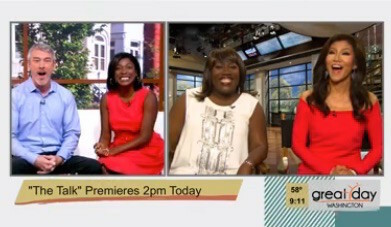 Today I got to chat with Julie Chen and Sheryl Underwood from the CBS show The Talk and it was so cool. Julie Chen is, of course a veteran and true gem of daytime TV. Sheryl and I go way back from my days at BET when I was a content producer for Comic View, amongst other shows. I don't know if she remembered me, but it felt so good to talk to her again and see how far she has come in her career. Sheryl was a truly professional and always showed up on time, ready to work and ready to network. I guess that's why she prevailed over so many others on the comedy club circuit to be where she is today—on her sixth season as cohost of The Talk on CBS... You go girl!